Located in Maine's affluent West End neighborhood, the Inn on Carleton is a beautifully restored 1869 town home that offers a tranquil escape from the hustle and bustle of the city. 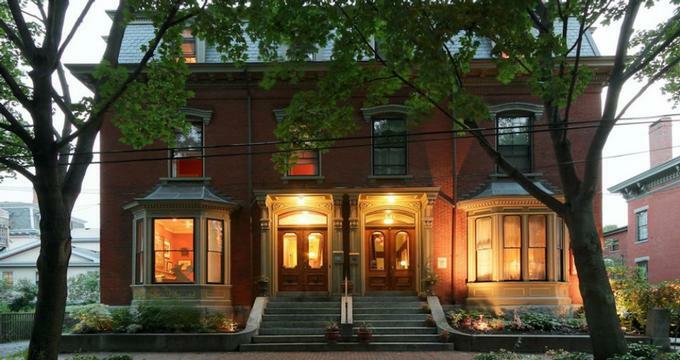 Set on a quiet tree-lined street close to the center of downtown Portland and its vibrant arts district, the Inn on Carleton is the oldest established bed and breakfast in Portland. The charming inn features six well-appointed and individually decorated guest rooms with en-suite bathrooms and lovely garden views. Guests are treated to a sumptuous gourmet breakfast every morning and can enjoy a glass of wine in the communal living room or the English country-style garden in the afternoons. The Inn on Carleton is ideally based for exploring the attractions of Maine, such as Longfellow Square, the Portland Museum of Art and the Old Port with its working wharf, cobblestone streets, and small eclectic shops. The Inn on Carleton features six well-appointed and individually decorated guest rooms with en-suite bathrooms and lovely garden views. Opulent, elegant and comfortable, guest rooms at the Grand Victorian Inn are decorated in warm and vibrant colors with espresso and dark mahogany furniture and hardwood floors. High ceilings and natural light create serene havens, all of which have en-suite bathrooms and luxurious amenities. This room is located on the second floor of the house and is decorated in soft green hues. The room has a queen-size pillow-top bed with luxury linens, a cozy settee and writing desk and chair, and an en-suite bathroom with a walk-in shower, plush towels, and branded bath products. Boasting grand moldings and rich hues, this room is located on the second floor of the house and features a beautiful queen sized four poster bed with luxury linens, two armchairs, and an en-suite bathroom with a large walk-in shower, plush towels and branded bath products. Set on the second floor overlooking the garden, this room offers a suite-like ambiance with a sumptuous king-size bed in luxury linens, an en-suite bathroom with a walk-in shower, plush towels and branded bath products, and high ceilings with intricate crown moldings. Decorated in rich blue tones on the third floor, this appealing room features a queen-size bed with plush linens, comfy arm chairs, and beautiful artworks on the walls. The room has an original fireplace mantel, which has been fitted with an electric insert and an en-suite bathroom has an antique claw foot tub and a walk-in shower, fresh towels and branded bath products. Two large windows flood this room with natural light, which can be found on the third floor and features a queen-size bed with luxury linens, and an en-suite bathroom with a walk-in shower, fresh towels and branded bath products. Located on the third floor of the house with inviting garden views, this bright and sunny room has a beautiful queen four-poster bed in luxury linens, and an en-suite bathroom with a spacious walk-in shower, plush towels, and branded toiletries. This room offers extra levels of privacy and seclusion with a suite-like ambiance. The Inn on Carleton serves a delicious two-course breakfast every morning, beginning with freshly brewed artisan coffee and organic teas, and fruit juices, followed by a selection of daily rotating sweet and savory dishes, egg dishes, cereals, yogurt and fresh fruit. Special dietary requirements and request can be accommodated. Amenities at The Inn on Carleton include a delicious two-course breakfast served every morning, snacks and beverages available throughout the day, beautiful gardens and grounds in which to relax and soak up the ambiance with fellow guests, and an array of concierge services. The Inn boasts beautifully manicured gardens and patios in which to unwind and is within easy walking distance of Portland’s residential and historic West End District, which is packed with museums, art galleries, cafés, and bars.